Fourth of July Concert & Fireworks Show (Library Park @ 3 p.m. – 9:30 p.m.). The public is invited to enjoy Monrovia’s Independence Day celebration featuring live performances and a spectacular fireworks show. Entertainment will begin at 3 p.m. with recorded music until 7 p.m., when a live band will begin to perform. The fireworks show is scheduled to start at 9 p.m. and will last approximately 20 minutes. All events are free of charge. 626 Night Market (Santa Anita Racetrack @ 4 p.m. – 1 a.m.). The original and largest Asian-themed night market in the United States returns for its fifth season this summer. 626 Night Market features over 200 food, merchandise, crafts, arts, games, music and entertainment attractions in one jam-packed weekend of festivals that appeals to all ages. 626 Night Market aims to unite and empower the community by serving as a platform for showcasing local entrepreneurs, businesses, artists, and talent. The night market is open from 4 p.m. – 1 a.m. on Friday and Saturday, and 4 p.m. – 11 a.m. on Sunday. Tickets are $3 on Friday and Saturday, and $5 on Sunday. Make sure to check #626squad throughout the day for special discounts and promotions and enter through Gates 3 & 5 on Huntington Drive or Gate 8 on Baldwin Ave.
Movies at the Park: “Sing” (Arcadia City Hall West Lawn @ 6:30 p.m.). Enjoy a beautiful night under the stars watching the hit animated movie “Sing” with friends and family. Games and activities begin at dusk and hot food, drinks, and snacks will be available for purchase throughout the night. Drum Corps at the Rose Bowl (Rose Bowl @ 5:30 p.m. – 9:45 p.m.). If you like the marching bands in the Rose Parade, this event will blow you away! Corps at the Crest is a national drum and bugle corps performance competition that spotlights 1,100 youth from 12 drum and bugle corps. These are elite marching bands that perform an intricate blend of music and movement. The show is part of the Drum Corps International (DCI) summer tour of 100 similar events across North America. Doors open at 4:15 p.m. and tickets range $35 to $45. Walking Tour: Pasadena Historic District (Old Pasadena Historic District @ 9 a.m. – 11 a.m.). Old Pasadena has gone from drab and dingy to a trendy shopping and dining destination. Without Pasadena Heritage, this National Register Historic District would have been destroyed! Now it is one of the finest examples of downtown revitalizations in the country. Let one of Pasadena Heritage’s trained docents lead you through the historic neighborhood and reveal its many hidden and unusual architectural details, old alleyways and historic signs. PCC Flea Market (Pasadena City College @ 8 a.m. – 3 p.m) Come enjoy the browsing and the bargains at one of the Southland’s largest flea markets, which is held the first Sunday of every month. With over 500 vendors, the Market features fascinating antiques and collectibles, thousands of records, tools, clothes, toys and much more, not to mention food and good company. Proceeds from every Pasadena City College Flea Market benefit student scholarships and student activities. Baby Gym (Pasadena Public Library @ 10 a.m. – 11 a.m.). Spend an hour playing with your child at the library! Meet other parents and have fun with baby. Different activities set up to stimulate motor, visual and language skills will be available. Babies up to 2-years-old are eligible and participation is free of charge. 91st Annual AMERICAFEST Presented By Honda (Rose Bowl @ 10 a.m.). 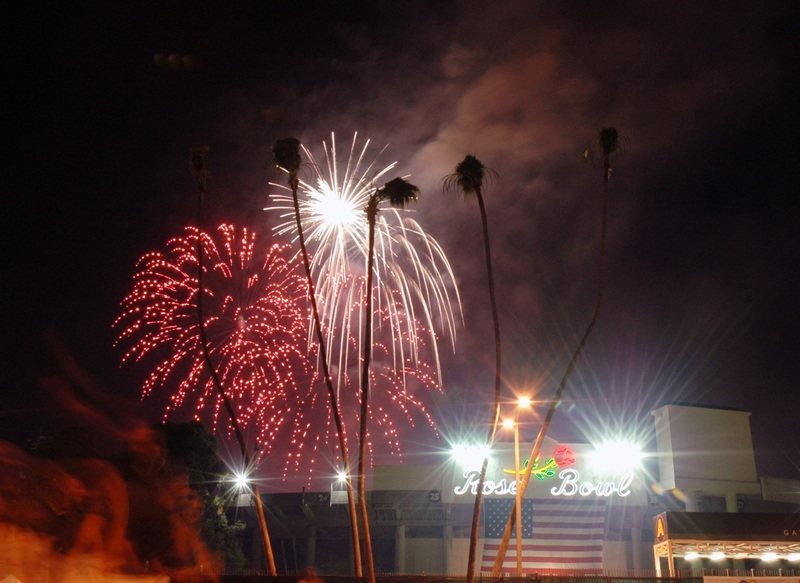 Honda presents an unforgettable day of food, entertainment and fireworks at its 91st annual Independence Day celebration at the Rose Bowl. The event kicks off at 10 a.m. with an active military spouse pampering social, which is exclusive to 30 men and women will be treated to food and beverages, a massage, a manicure and a free Core Power yoga class. The Family Fun Zone opens at 2 p.m. and the VIP Reception, which includes a complimentary BBQ dinner, begins at 5 p.m., half an hour before doors open. Live performances begin at 7 p.m. and at 9 p.m., the fireworks show commences. Tickets are $15 for General Admission (children 5 and under are free) and $30 for Reserved Seating (children 2 and under are free). Summer Benefit Night at Canoe House (Canoe House @ 5 p.m. – 8 p.m.). Join Sierra Club Pasadena Group for an evening of good food and casual conversation and learn about the group’s outings and conservation activities. A percentage of the proceeds from your meal order will benefit the Pasadena Group conservation and outreach activities. Come any time at Canoe House. On-site and street parking will be available. Call (909) 596-6280 for ticket costs. Old Pasadena Summer Cinema returns for another year as a month-long, free movie series featuring nearly 20 screenings in predominantly outdoor locations. (121 E. Union Street, Pasadena, CA 91105 @ 7:30 p.m. – 9 p.m.) All the Old Pasadena Summer Cinema screenings are free and open to the public. This week’s movie is “Song of the Sea,” nominated for an Academy Award for Best Animated Feature in 2015, “Song of the Sea” is a beautifully animated film that tells the tale of Saoirse, a mute child who is the last in a long line of “selkies,” women in Irish and Scottish legends who transform from seals into people. She escapes from her grandmother’s home to journey back to the sea and to free fairy creatures that are trapped in the modern world. Seating is provided at Flower Pepper Gallery, but be sure to arrive a little early as space is limited.